← Employee Spotlight: Getting to Know The Leonard’s Team! The 1930s are known best for The Great Depression and the severe economic hardships that were felt worldwide. Despite the effects of The Great Depression, there were still innovations being made in many areas, including technology, aviation, film and the arts. During this time, St. Augustine experienced innovations of its own. As the economy rebounded by the mid to late thirties, commercial fishing began to blossom into a booming industry. Many different people from various regions and cultures flocked to St. Augustine contributing new techniques to the fishing and boatbuilding industries. It was also during this decade that the famous Villa Zorayda Museum opened its doors. The building was constructed in 1883 as the residence for Mr. Franklin Smith. It is 1/10th the scale of a section of the Alhambra Palace in Granada, Spain. The building itself is considered to be a great masterpiece; made from coquina in the Moorish Spanish architectural style. The museum featured priceless antiques and well known collections that remain on display today. In 1933, our beautiful Castillo de San Marcos was transferred to the control of the National Park Service, where it remains today. Prior to this transfer, the Fort had been cared for by the War Department and the St. Augustine Historical Society. This transition proved to be beneficial. Renovations of the Fort began during the mid thirties. Under the National Park Service, the Fort’s preservation was guaranteed. Now that you all have an idea of what was going on during this decade, we can refocus on the Tuckers! 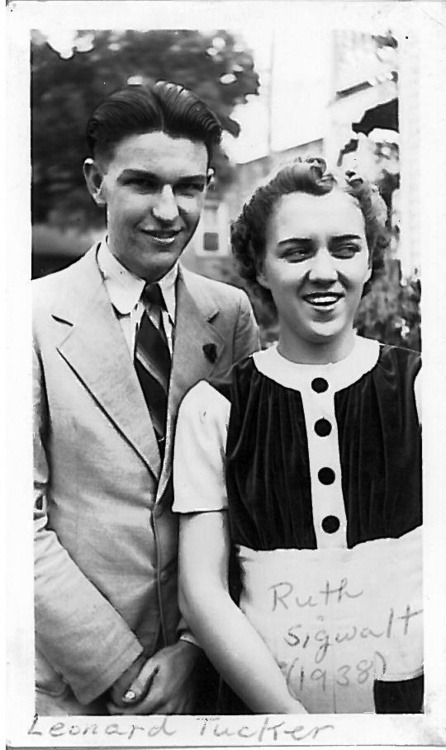 This week I have put together a collection of photos of our founders, Leonard and Ruth Tucker, from the 1930s. Through the photographs, we see Leonard and Ruth’s adolescent and teenage years. Although the forties are where it all begins, it was during this decade that their budding romance emerges. This entry was tagged business, History, Life, Marketing, Media, photography. Bookmark the permalink.